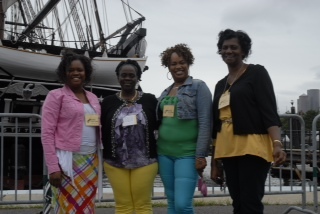 This summer our ESL/Citizenship classes took another trip, this time to Boston, MA. Here we explored the Freedom Trail, USS Constitution, and Quincy Market. We took a guided walking tour along the Freedom Trail. We saw the Old South Meeting House, Old State House and the site of the Boston Massacre. 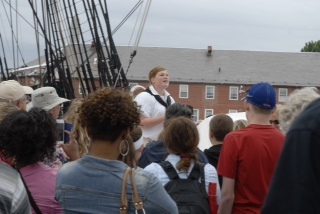 We also explored the USS Constitution. 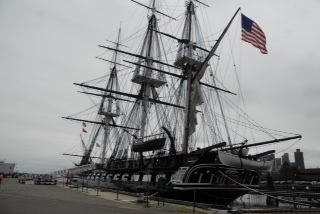 The USS Constitution is the world’s oldest naval vessel afloat. Students were in awe to see this. For many, it was their first time being on a ship like this. They did not realize these ships still existed. It was truly a new experience for them. At Quincy Market the students were met with the sights, sounds and scents of Boston. Food, shops and street performers were all around. Our students grabbed some food and watched the entertainment of street performers while we waited for our tour to begin. At the very end of our outing mother nature decided it was time for a downpour. Despite the rain, the students had an amazing time, enjoyed every minute and were very grateful. This August marked this blog’s 1 year anniversary. Hooray! In July there is an ESL/Citizenship class trip to the 9/11 Memorial and the Museum of Native American History. That is where we began last year and where I begin today. As I noted last year, for some students, this was their first time in NYC. The shock and awe at seeing “the Big Apple” in person for the first time is truly a sight to see. Some of our students were repeat visitors from last years trip. For those students, they noticed the changes that had taken place at the memorial over the last year. 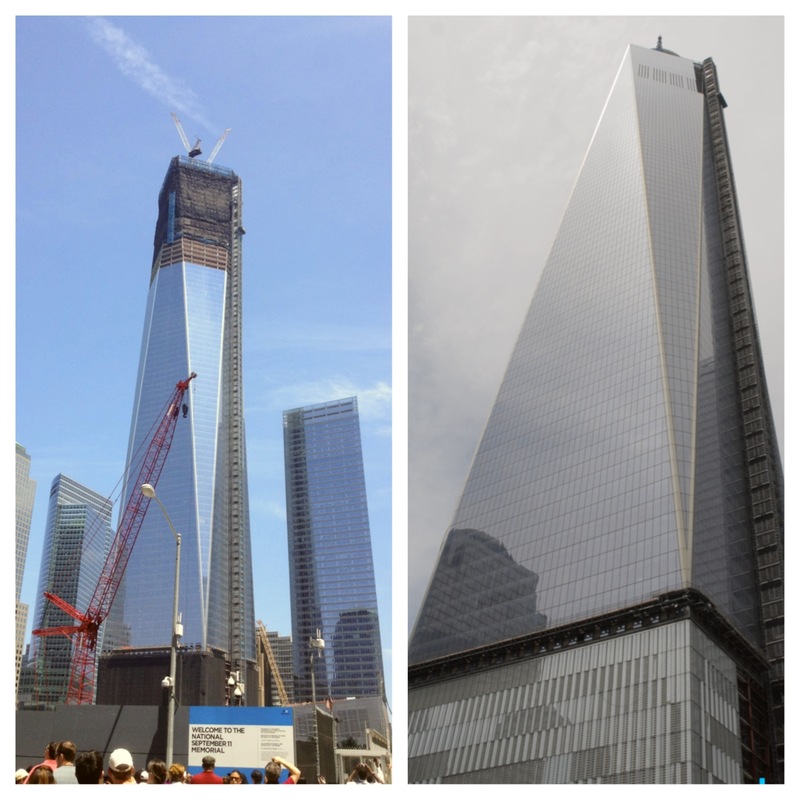 The Freedom Tower which was still under construction last year was completed this year. It is still not open but the major construction on the exterior of the building is done. They felt more confident when walking throughout the city. It was a bolstering hot July day and this group of 45 people had a great day exploring NYC and learning about the rich history and culture of America. Last week I witnessed a “sweet bridge” moment at The American Place (TAP). 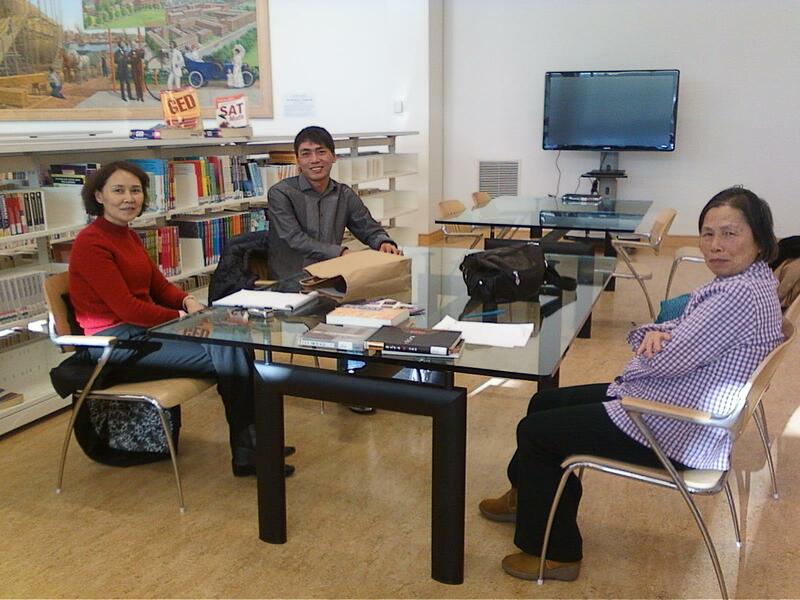 A few weeks ago I started tutoring a Chinese woman who is temporarily living in Hartford with her adult son while he completes an internship. She is feeling very isolated as she knows no English and her son is gone all day at work. I speak Mandarin Chinese, which is why I was brought on board to meet with her weekly to provide a bit of English tutoring and also some companionship. Hartford does not have a very big Chinese community. I was working at TAP when a Chinese woman walked in looking for some books in Chinese. She lives in Simsbury and although she does speak English well she also feels isolated and has had a hard time getting to know people. It is difficult to be a foreigner! On a whim, I called my student and asked if she wanted to meet someone from China. She came right over to TAP and the two of them hit it off. Coincidentally, another Chinese patron arrived shortly after the two women sat down. Overhearing their animated conversation in Chinese, he went over and introduced himself. He also lives in Hartford, knows no English, and is feeling isolated. ﻿﻿﻿Last Tuesday morning, a group of the library’s adult English language students went for a tour of the majestic Hartford City Hall, located just across the street. The place is amazing! Veteran Hartford resident and current town clerk, John Bazzano, was our guide. Constructed in 1914 on land donated by Hartford resident and financier, J.P. Morgan, this city jewel boasts exquisite turn-of-the-century architectural designs, including marble stairways, gilded décor, and vaulted glass ceilings. The Christmas tree made from red poinsettias added some nice holiday cheer. But more importantly, we had a chance to find out what City Hall does for Hartford residents, such as providing birth, marriage, and death certificates, property deeds, and voter registration cards. City Hall is also home to the Mayor’s office and is the place where city laws are passed by the city council. We had a chance to visit these rooms and even sit in the city council chairs! Hartford residents are welcomed to go to the Mayor’s office with any questions or needs, and to attend city council meetings on the second and fourth Monday of each month at 7pm. 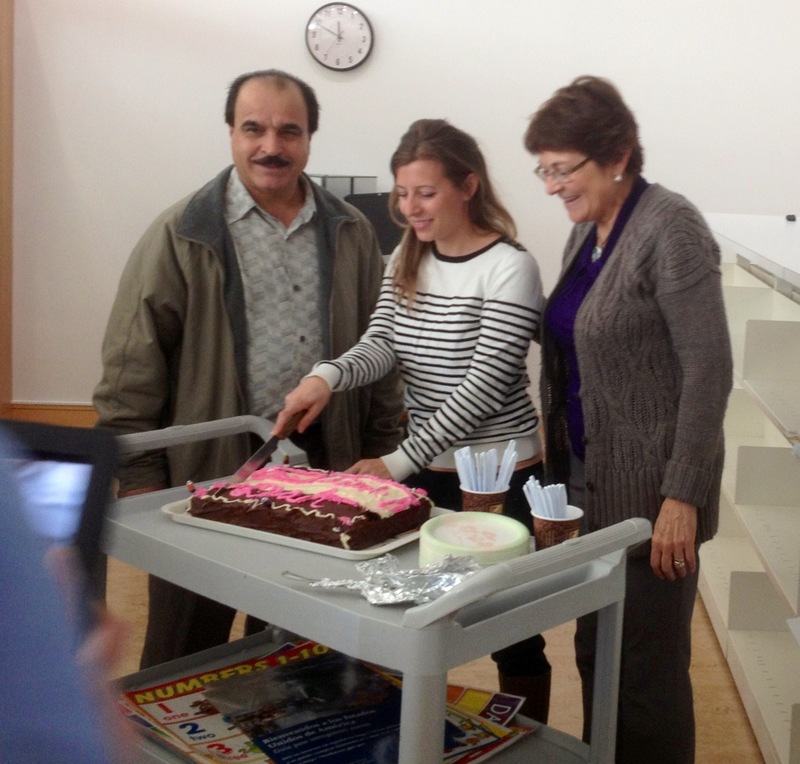 Last week we said goodbye to one of our ESL teachers, Leah Atruia. She found a job teaching in another city. Leah has been with us for over a year. Her students appreciated her very much. On her last day with us, one of our colleagues, Luisa, baked her a cake. Both of our ESL classes joined together for a going away coffee and cake. There was such a sense of appreciation from both Leah and from the students. They are so grateful for what they have learned in the past year. Although we are sad to see her go we wish her the best. “We the People”…such popular and powerful words. Not only is this phrase the first 3 words in the Constitution, it also hangs in the American Place at our library. There are glass panels that hang in front of the windows to reflect these very words onto the ground once the sun shines through. For months I have been curious to see if it would actually work. Finally this Monday I was able to see the glass panels in action! Today I was reminded of this very phrase this morning as one of our ESL students fainted in class. Her classmates were so worried about her even though they could barely communicate in the same language. This poor woman who had a bad reaction to her medication had no one we could call to accompany her to the hospital. One of our interns volunteered to go with her to the hospital and stayed with her until she was stable and comfortable. Many different people united for the same outcome-this woman’s immediate well being. The woman who fainted is from Morocco, the man who helped her and waited with her until the ambulance came is from Ecuador, the intern who went to the hospital with her is from Nepal, our program director who helped the rest of the class remain calm is from Iran, and today’s ESL class is made up of people from over 21 countries. “‘We the People” could not fit more appropriately. Kindness and concern are universal emotions that transcend a language barrier. In this case, “We the People” stick together. Today I was thinking about technology. It is something that dominates most of our lives these days. Phones, computers, ereaders, game consoles-the list is endless. What is most interesting that our time is spent playing virtual farm games with someone on the other side of the world, reading about the lives of others on facebook and checking our email. I am starting to wonder if the art of communication will someday be primarily virtual. How many times are you somewhere with other people and not even a Hello is exchanged and everyone is on their various devices? During the last portion of todays ESOL class the students were using our computers to work on their reading. It was refreshing to speak with these students and show them how to use the computer. In such a technological age they are still not dependent on technology. The art of communication is still visible even though not all of the students can speak English well and all are from different countries. ﻿﻿﻿﻿﻿﻿﻿﻿Welcome to my blog! Here I will share some of the amazing experiences I have at my job as an Outreach Assistant at The American Place at The Hartford Public Library. 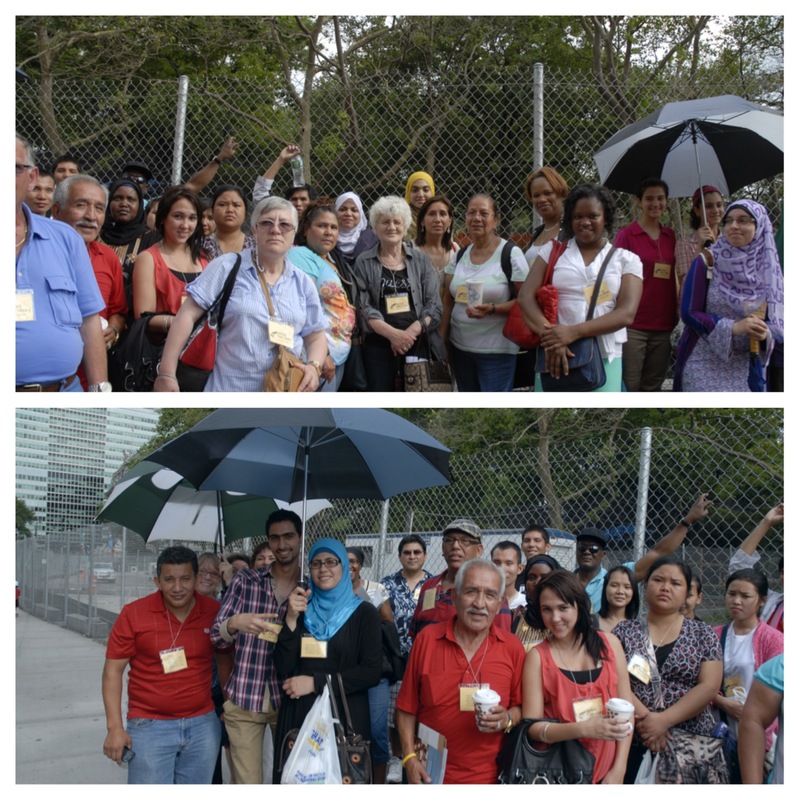 To start I will share some photos from our ESOL & Citizenship class trip to the 9/11 memorial . Attendees of this trip include students from many countries such as Dominican Republic, Iraq, Russia, Peru, Mexico, Vietnam and Haiti. One of the most memorable things on this trip was the significance of this group of people together and this memorial. 9/11 made American’s more concerned with safety and also may have given certain groups of people a bad rap. Each of these students understood the effect 9/11 had on America and some have had personal effects. It was amazing to see such a diverse group of people together as one. The memorial is still under construction. We were able to walk around the 2 reflection pools. They were utterly amazing. The sound generated by the 2 reflection pools is so great that it’s the main thing you hear even though there is construction all around.